From fertile soils and green grasses comes a most precious whole food supplement: grass-fed, X-Factor butter oil! It is the job of happy milking cows to munch growing green grasses and to produce rich creamy milk, which is then skimmed and centrifuged to make this beautiful, golden butter oil, casein and lactose free! According to the research of Dr. Weston A. Price, cod liver oil and butter oil, when taken together, provide complementary factors leading to proper essential fatty acid balance. High-vitamin butter oil contains arachidonic acid (AA), an omega-6 fatty acid, while cod liver oil is rich in eicosapentaenoic acid (EPA), an omega-3. Moreover, the saturated fatty acids in the butter oil promote efficient utilization of the unsaturated fatty acids in the cod liver oil. 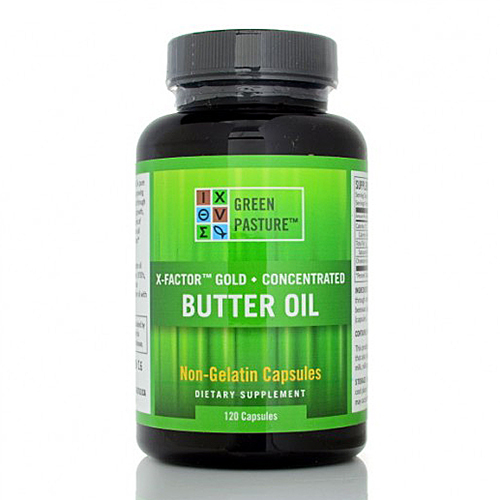 Finally, butter oil contains a broad and deep range of important quinones including vitamin K, E and CoQ enzymes while cod liver oil is rich in vitamin A and D.
Dave Wetzel of Green Pasture advises that Skate Liver Oil contains the same X-Factor that the High Vitamin Butter Oil contains. Most people who react to other dairy can take the butter oil, but the skate gives you an alternative. and Trace vitamins and minerals. Blue Ice Royal is a sacred food blend of 1/3 X-Factor Gold™ High Vitamin Butter Oil and 2/3 ..